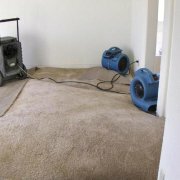 Rent water damage drying equipment in the Sacramento / Placer / El Dorado County areas at great low rates! Turbo Air Movers, carpet dryers, blowers: $17.50 ea. per day or $75.00 per week. 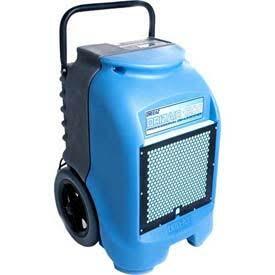 Dehumidifiers (medium): $40.00 ea. per day or $180.00 per week. 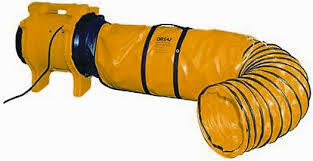 Air Scrubbers, 100-500 CFM $40.00 each per day or $180.00 per week plus $175.00 for replacement of internal filters. Do I really need a dehumidifier to dry something out? Most often the answer is Yes! Fans, blowers and air movers evaporate moisture rapidly into a vapor. This makes the air "wet" or excessively humid, which means the "relative humidity" rises (like a sauna). Dehumidifiers remove excess moisture from the air which allows for faster evaporation of wet carpet or building materials. See illustration below. How do they work? 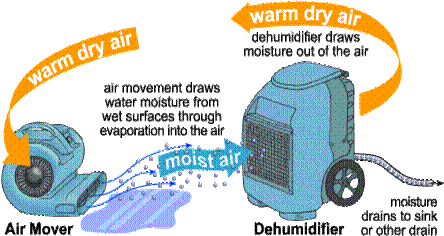 Dehumidifiers remove excess humidity (water vapor) by drawing moist room air over cold refrigerated coils. The moisture in the air condenses into droplets as it passes over the cold surfaces in the dehumidifier and into a container. "Dried" air then returns to the room at approximately its original temperature. For best results, the unit should be located in an area closed to outdoor air and where air movement in and out of the unit is not restricted. What does an air scrubber do? Need to control dust or work in a moldy area? 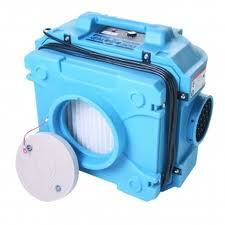 An air scrubber is a portable filtration system that removes particles from the air within a given area. These machines draw air in from the surrounding environment and pass it through a series of filters to remove contaminants. This "Dri-Eaz Vortex" air mover (above) will ventilate confined spaces throught up to 125 feet of stow and go ducting or propel dry air across large open areas to aid in drying. Improve indoor air quality; remove unwanted odors. 2041 max cfm. $25.00 per day. Need to Rent Fans, Air Movers, Dehumidifiers or Air Scrubbers? 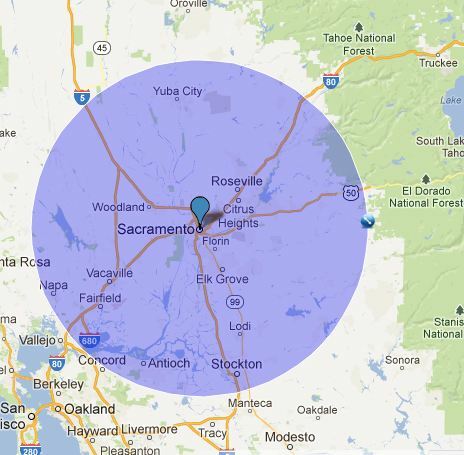 Call us at 916-985-8973 In the Sacramento Area. Air movers, turbo, fans, carpet dryers, blowers, dehumidifiers, rental to the following ares: Amador | Antelope | Auburn | Cameron Park | Camino |Carmichael | Citrus Heights | Colfax |Courtland | Davis | Dixon | El Dorado Hills | Elk Grove | Fairfield | Fair Oaks | Folsom | Forest Hill | Galt | Georgetown | Granite Bay | Grass Valley | Ione | Isleton | Jackson | Knights Landing | Lincoln | Lodi |Loomis | Mather | Marysville | Nevada City | Newcastle | North Highlands | Orangevale | Penryn |Placerville | Pollock Pines | Rancho Cordova | Rancho Murieta | Rio Linda | Rocklin |Roseville | Sacramento | Sheridan | Shingle Springs | Suisun City | Vacaville | Wheatland | Woodland | Yuba City | West Sacramento | Wilton | CA.